In Colonial times, travelers from Annapolis arrived at Rock Hall via ferry (George Washington and Thomas Jefferson took this route to Philadelphia). Today, with 15 marinas, Rock Hall is a favorite destination for pleasure boaters. Rock Hall visitors have a variety of dining, recreation, and shopping options. Be sure to visit the old fashioned soda fountain at Durding’s Store. Rock Hall’s small but pleasant public beach offers a nice expanse of sand that is protected for swimming by a breakwater. The view of the Bay from the beach is very nice. 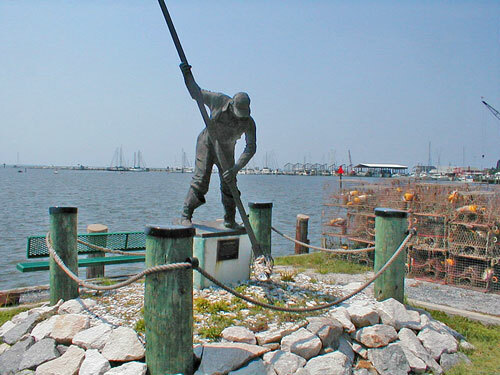 The Waterman’s Museum, featuring exhibits on oystering, crabbing, and fishing, is located on MD 20 in Rock Hall, next to Haven Harbor Marina. The museum includes historic photos, local carvings, and a reproduction of a shanty house. If you continue about 8 miles south of Rock Hall, you will arrive at Eastern Neck National Wildlife Refuge. The ENNWR includes 1,000 acres of brackish marsh, 600 acres of cropland, 500 acres of forest, 100 acres of grassland and 40 acres of open water impoundments. The refuge is open to visitors and has hiking trails, an observation tower, picnic tables, public fishing areas, and a car-top boat launching area. (It is strongly suggested that you use insect repellent while visiting the refuge). Friday night sailing races are held throughout the summer and fall seasons. The races start at 6:00pm at the Huntingfield Light outside of Rock Hall Harbor. If you would like to participate in the races, forms and additional information are available at local Rock Hall marinas or online. Rock Hall has one motel, the Mariners Motel, and several inns and bed & breakfasts. Rock Hall Events – Upcoming events scheduled for the Rock Hall area. www.rockhallmd.com: provided by the local Office of Tourism. Kent County Office of Tourism: information on nearby sites. Tolchester Beach Revisited: A museum about an amusement park from days gone by. Friday Night Sailing: Race results and registration information. Visit Rock Hall, Md. Find Rock Hall travel reviews, hotel and bed & breakfast reviews, and more. Traveler Reviews of Rock Hall B&Bs, Restaurants, and Attractions. Read traveler reviews at TripAdvisor. Rock Hall Real Estate – Find homes for sale in the Rock Hall area.